Buttercrunch toffee usually consists of layers of crunchy caramel, chocolate and almonds. The idea of caramel and chocolate is old school in the history of confectionery. But, still, it is one to feel excited about, as it is pretty easy to make on your own. And yes, even if you are new to toffee making. It is one of the most valued homemade gifts one can make; especially during holidays when everyone is up to their ears with cookie doughs. The recipe I provide you with here is for a 35 cm. x 40 cm. (14 in. x 16 in.) slab which is broken roughly into pieces. We usually distribute it among small transparent bags (always food grade, please) and gift to excited recipients, who, just by the looks of it immediately understand that there is something precious inside. 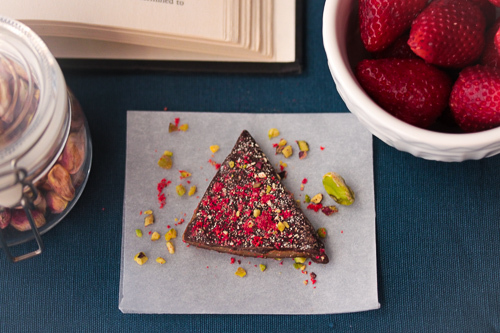 This version, in particular, sparks the maximum amount of joy possible, as the almonds are replaced with pistachios and strawberry powder. Sprinkled over the chocolate they enhance the naturally vivid green and red colours. This gives a whole new meaning to an otherwise visually indifferent piece of toffee. Well, as far as a piece of toffee can be visually indifferent to someone. In this recipe, an amount of dark muscovado sugar is added to the toffee at the end of the cooking process. 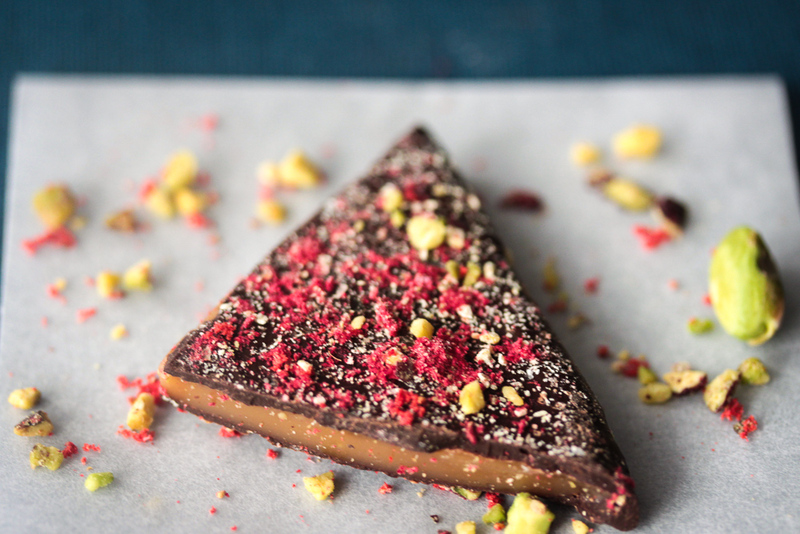 It is a lovely addition as it alters the final texture of the toffee. The result is a less dense caramel, more gentle to the teeth. Furthermore it enriches its flavour, uplifting it in a way that vanilla extract cannot. You can definitely omit it if you like, in which case the resulting caramel will be harder. For this reason I would recommend spreading it out a little bit more to thin it. This recipe makes a large batch which yields 1.5 kg caramel, enough to feed a party. You can halve it if you like. But in my mind this is a crowd pleaser and I always go for the big batch. If your dark muscovado has hardened during storage, it is recommended to soften it again. In a microwave oven: simply put the sugar in a microwave-safe bowl. Lightly moisten a paper towel and gently fold it and gather it on the surface of the sugar. Cover it with a plate and microwave it for 20 seconds. Check if it has softened; if not, repeat in 10-second bursts. Fluff it gently with a fork between each burst. In a jar/container: this method takes longer to soften. Put the hardened sugar along with 2 pieces of unpeeled apple in a jar/container. Cover tightly with its lid and leave for a few hours. The muscovado sugar absorbs the natural moisture of the apple and becomes soft again. This can also be done quickly if you put a small amount of muscovado sugar in a thin layer, arrange apple slices on top and cover tightly, in which case it may take no more 10-20 minutes, depending on the hardness of the sugar. Put the measured muscovado sugar in a bowl and start massaging it with your fingertips. Your aim is to find the lumps that form from the natural concentration of molasses and press them with your fingers to dissolve them. Make sure you break down even the smallest ones. This process will result in a properly homogenised buttercrunch in its final stage. Working with caramel requires that everything you need is ready in advance; once the caramel reaches the desired temperature, you will have to work quickly and precisely before it starts setting. Lay a tray with a silicone mat, roughly 36 cm x 43 cm (14 in x 17 in). The tray should be big enough for the mat to be completely flat. If you do not have a silicone mat, you can use parchment paper. Cut in two pieces. Then place them vertically overlapping each other to create a surface of 36 x 43 cm. Keep a metal offset icing spatula nearby. Place the bowl with the muscovado sugar next to the stove to have it ready. In a large saucepan place the butter, white granulated sugar and salt. Warm over medium heat, stirring often with a silicone spatula. When the butter melts and the sugar dissolves, raise the heat to medium-high. From now on keep stirring constantly. Stick the thermometer into the caramel, taking care its tip doesn’t touch the bottom of the saucepan. Continue cooking and stirring till the caramel reaches 150º C (300ºF). The whole cooking process may take 20-30 minutes. Remove the saucepan from the heat and immediately add the muscovado sugar. Stir quickly (but carefully – it is hot!) till the muscovado dissolves and the mixture homogenizes. Pour it carefully over the prepared silicone mat/parchment paper; quickly take the metal icing spatula and spread it in an even layer. Let it cool completely before covering it with chocolate. Using a paper kitchen towel, gently wipe the caramel to remove any excess oils from the surface. Failure to do so will prevent the chocolate from attaching effectively onto the toffee. Melt and temper the first batch of chocolate (300 gr / 10.5 ounces). Using a metal offset spatula, spread the first batch of melted chocolate onto the toffee. Immediately sprinkle half the ground pistachios over it, followed by half the strawberry powder. Leave at room temperature for the chocolate to fully and properly set. To turn upside down the toffee, layer another piece of parchment paper onto it and put a tray on top. Keeping the toffee sandwiched between the two trays, turn it upside down so the uncovered side faces upwards now. Remove the upper tray, and repeat the process of covering with the remaining chocolate and toppings. When fully set, using your hands, break into pieces. Buttercrunch toffee, covered with tempered chocolate, can be stored in an airtight container in a cool and dry place, for up to 4 weeks. If you don’t temper (meaning you just melt it and cover the toffee) the chocolate, it is best stored in the fridge, in an airtight container. When you simply melt chocolate and use it to cover the toffee, the chocolate will take a lot of time to fully set. Furthermore, the colour will be dull and after some days it will “bloom”, meaning it will develop white lines. Whereas these are not an indication that the chocolate is spoiled, they look unappetizing. Another problem is that the chocolate will start melting from your body’s temperature as soon as you hold it in your hands. When using chocolate to cover something which you will store at room temperature, it is best to use a method called tempering. Chocolate tempering, results in a perfect chocolate, with a shiny, consistent gloss. Moreover, it is melt resistant and professional grade. Below you will find links to four methods on tempering chocolate. I strongly encourage you to give the one that suits you a try. A similar method, requiring a thermometer, a piece of tempered chocolate and no physical involvement is this by David Lebovitz.